Linphone is free VoIP(Voice over Internet Protocol) phone and open source project for desktop computers, smartphones, tablets and web browsers which is developed by Belledonne Communications in France. Linphone was the first open source software to use the session initiation protocol (SIP) with VoIP. 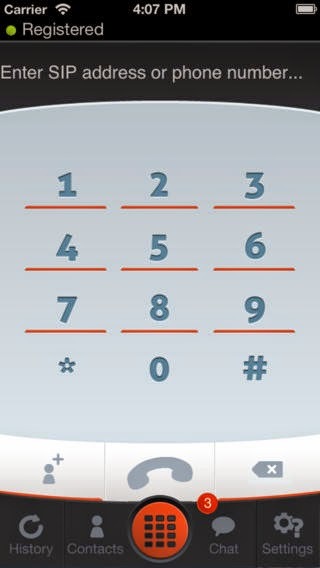 Using Linphone, we can do voice & video calling, chat, send files, etc. I used Linux operating system to start working on Linphone Android. So, I will share all things to start working on Linphone step by step. 1. Install Linux/Ubutu 32 or 64 bit operating system. Open “ubuntu software center” and search “java” and than install “Open JDK Java Runtime”. Open “ubuntu software center” and search “eclipse” and than install “Eclipse”. 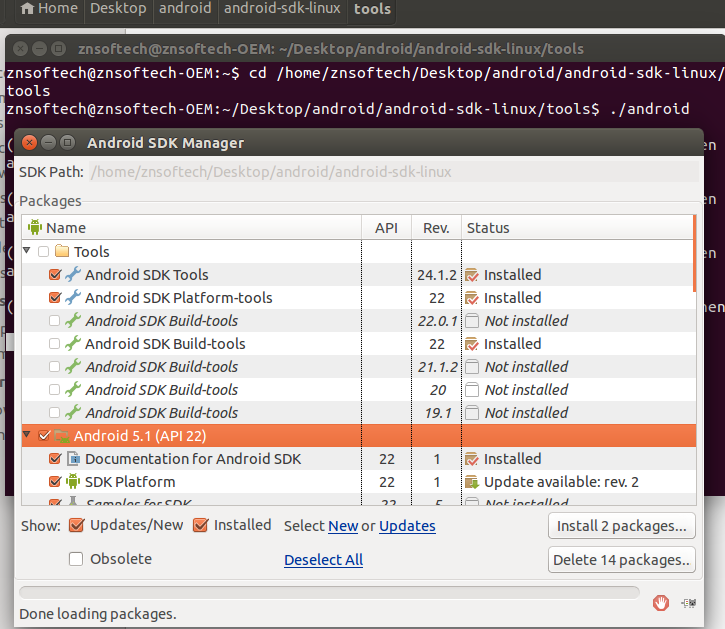 Go to android developer site: Android SDK and scroll down and then download .tgz extension file. After completing download, right click on file and than press “extract here” option. Now you will get android-sdk-linux folder. 5. Install Android SDK Packages. Now open terminal by using CTRL+ALT+T command or by searching: press super key(window key) than search “terminal” than open it. press enter and than select latest android API, tools and libraries according to your requirement. Click on Install packages than accept License and than install. 8. Setting up an Android Virtual Device. 9. Install ADT plugin on Eclipse. After restarting eclipse, add sdk and ndk location in eclipse(Window -> Preferences). Till now, all android project environment is set. Now, we need to install sum more libraries for Linphone android project. 10. Install Libraries and Tools for Linphone. run all commands on terminal one by one. 11. Download git repository of Linphone android. Run the following command to install git and Linphone android project from github site. Open terminal and go to linphone android directory. now run the Makefile script in the top level directory. This will download iLBC source files and convert some assembly files in VP8 project. 13. Import Linphone Android Project to Eclipse. Open Eclipse and selcet File -> Import... -> Android -> Existing Android code into Workspace -> Browse... and than select linphone-android folder(Only select linphone-android and don't tick on “copy projects into workspace” ) than OK.
Hi. Thanks for your tutorial! I was able to follow up till step 8. When I entered android avd, it says command not found. I did opened up a new terminal... Do I need to cd to anywhere else? Any ideas to resolve this? Please help me! Thanks!! No need to change directory. Check given link on step 8 as well. moshin can we talk i am facing some issue compiling linphone.. Thanks Moshin well done ! You set the target build Android 5.1,what will be the minimum SDK? The NDK version is revision 10d I used instead 10e and crash at runtime. Do you recommend de r10e? but i got some problem here.. I can't install aclocal or libtoolize or pkgconfig on ubuntu 14.04.. can you explain how to do that? If you are using 32-bit pc than no need to install these packages. thanks for your reply.. and I got another problem here. make: *** No rule to make target `check_tools.mk'. Stop. Could not find ndk-build. Please install android NDK. Could not find android. Please install android SDK. Makefile:73: *** commands commence before first target. Stop. Do you have any ideas? I've already installed libxml2.. but i still got that error.. I use ubuntu 14.04 LTS.. Do I need to change or do something with this OS? I found that I don't have xmlParseDoc, xmlReadDoc, xmlReadFile.. where can i get these files? I thought that when I installed the libxml2, these files could be downloaded automatically.. but they didn't.. how do I do it? or you can scroll down and read my comment. :). hope it'll help you..
do you find a solution ? do you export path in bashrc file? if not you can edit it with gedit. Bashrc file in /home/yourUserName/..
-- Your folder "Téléchargements", I think because of this.. you should not use this, you should put it in a folder like "a" or "b" or just extract sdk and ndk in /home/hitech/yourSDK and the same with NDK. -- the commands I gave you, you run in the linphone-android folder. You should use source I gave you because that's the official code. :). They have some update.. If you don't use you may get some errors when build, because of the android M..:).. you can read the update in the second column. you reskin the app ? :d.. you're welcome.. I just like to make an app like that.. I am getting this error while running make command. and i cant find any solution. /opt/android-sdk-linux/tools/ant/build.xml:734: Compile failed; see the compiler error output for details. I fixed this issue turns out SDK wasn’t updated to the API 22. And i had error after this too but most of the issues came in 64bit Ubuntu I could not find solution for. But the compilation worked in 32bit Ubuntu error free. I am trying to working with windows OS. Can you guide me how to do that ? I have almost no experience of building or developing application of android ndk. I just print hello world today using ndk. While executing make from linphone-android, i am getting non_versioned_soname_patch_applied.txt failed. But i could not find non_versioned_soname_patch_applied.txt from linphone-android/submodules/externals/ffmpeg/ in the linphone-android source code. Please can you do a similar tutorial but this time for windows based users!! I managed to fix the sdk location error, but it still persists that my ndk is not installed.. which js and paths set right.. should i install 10c instead of NDK? when I do a make command, I got an error Missing some git submodules. Did you run 'git submodule update --init --recursive'? you are correct Sir. This happened due to copy-paste. does linphone compile and build in windows machine...? Author, your instructions are incomplete. You should ask to read inner README file, as instructions given by you aren't enough. You can remove this comment as well. Or, if you will be kind enough, would you answer my question? When I was doing this project I have used above instructions. Now there are some changes in new Readme file. This error comes due to c++ compiler but I am not sure. hi. which version of ubuntu did you use? Error:A problem occurred configuring root project 'linphone-android'. > Could not find io.socket:socket.io-client:0.7.0. Most of this is still valid but anyone having issues should read the README file in linphone-android folder. Linphone compiled successfully using Ubuntu amd64 16.04.1, SDK API 24, NDK r12b. How can we send Vcard from one chat room to another in linphone android? thanks a lot for your tutoria. the NDK to use should be android-ndk-r10e-linux-x86_64.zip ? why you used MAC version? A problem occurred configuring root project 'linphone-android'. > Could not resolve com.android.tools.build:gradle:3.3.
getting this error kindly help to fix this ? A problem occurred evaluating root project 'linphone-android'. i run the linphone sample project but i don't know how i can register with them... how the calling works... could you please help? I am using the linphone jar file for making audio as well as Video call. Audio call is working fine but when i try to make video call using the linphone jar, is not supporting.. The api linphonecore.isVideosupported() is always returning false. Can any one please help me.. 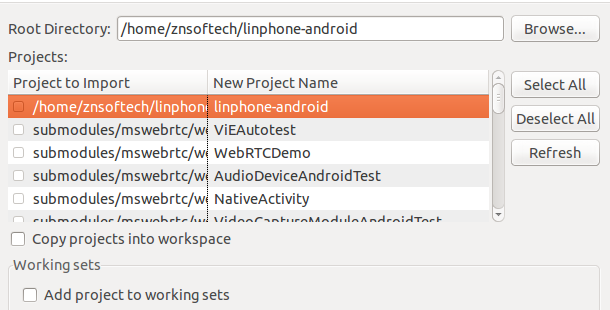 I have imported linphone-android as Android studio project after make. how can i solve that problem?